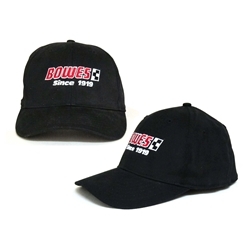 L/XL Black Baseball Cap with Bowes Logo Bowes AP HATS/ BLACK. Has PerfectFit technology. PerfectFit caps have no need for an elastic band around the entire circumference of the cap - thanks to a patented 4-way stretch channel—that means more comfort especially when worn during activities. NO EMBARRASING elastic indentions on your forehead. Subsequently, less strain is applied to the temple areas - reducing the occurance of discomfort from prolonged wear.